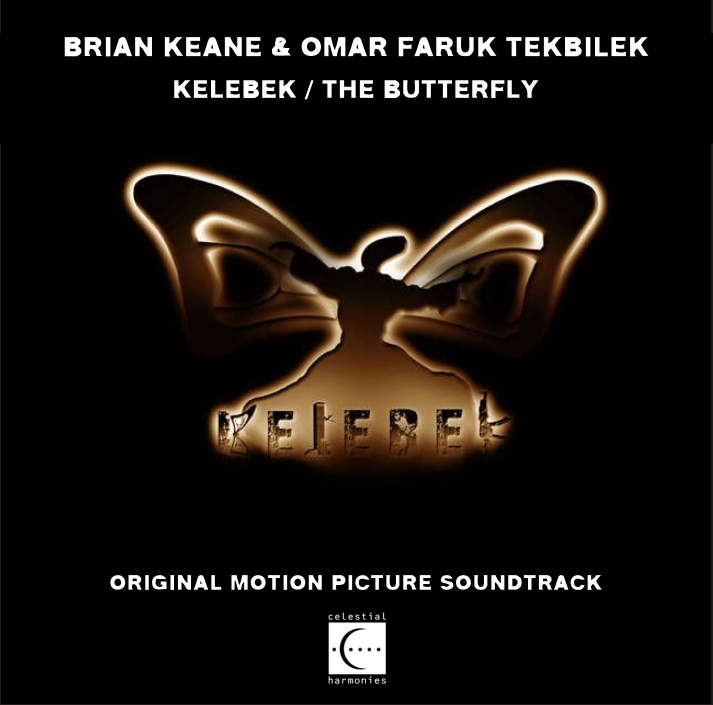 With the Kelebek / The Butterfly soundtrack, film producer Mahmut Bengi has brought Omar Faruk Tekbilek and Brian Keane together once again to create the music to this mystical and tragic story. The result is remarkable and moving. The score to Kelebek / The Butterfly effortlessly flows from East to West, from orchestral score to Turkish music, and into electronic sound design. The music moves just as effortlessly between moods, from mystical to tragic to suspense to folkloric or romantic. Whether it's the fusion of jazz and the red-hot Middle Eastern musicianship of On The Move, the beautiful melodic and harmonic East-West mixtures of Yusuf's Theme and Zeynep's Romance, the Turkish-folk-meets-American-roots music of Teacher, the simple and honest oud and guitar collaboration on Brother To Brother, the new age orchestra and ney of Butterfly, the moving and tragic Yusuf Prays/Lost Souls that features Omar's older brother Haci Ahmet Tekbilek on duduk with an orchestral adagio, Omar's haunting vocals over a multi-layered harmonium and sampled glass harmonica in Losing Hope, the bizarre and wonderful combination of Richard Hunter's harmonica playing with traditional Middle Eastern folk music in Street Fair (based on the Azeri folk song Menim Canimsan), or the Dervish updated to hip hop/electronic trance in Deep Blue, Brian and Omar continue to push the boundaries of musical tradition while simultaniously demonstrating a respect and affection for those traditions and their spiritual origins. Now in their mid-fifties, Omar and Brian have continued growing in their own worlds as prominent master musicians; this soundtrack for Kelebek / The Butterfly is testimony that their friendship and musical collaboration are truly enduring. Brian Keane and Omar Faruk Tekbilek met more than two decades ago, in 1987, when Brian Keane discovered Omar playing in a club called Fazil's in New York City. Brian had been looking for a Turkish musician, and it was the legendary producer Arif Mardin at Atlantic Records who was of Turkish descent (as were the two brothers who had founded Atlantic Records, Ahmet and Nesuhi Ertegun) who had pointed the way by recommending to check out Fazil's. Brian asked Omar to play on the score for the Suzanne Bauman documentary about the exhibition Süleyman The Magnificent, a co-production of the National Gallery of Art, Washington, the Metropolitan Museum of Art, New York, and the Topkapi Palace Museum, Istanbul. German record company owner Eckart Rahn noticed Omar's exceptional musicianship when the documentary was broadcast on the A&E channel, and the documentary soundtrack with a few new tracks added to fill the LP (yes, they were still making vinyl in 1987!) was issued in 1988. The collaboration of Tekbilek, Keane and Celestial Harmonies would grow to become among the most influential in both Eastern and Western music, pushing the boundaries of musical, spiritual and geographical traditions. Since then, Brian Keane has become a Grammy-winning record producer of more than one-hundred albums, and a multiple Emmy award-winning composer of more than four-hundred soundtracks while Omar Faruk Tekbilek has gone on to become an international recording artist and performing musician, and one of the most well-known and influential Turkish musicians in the world with concert appearances from the United States to Europe and Australia. Over the years, Omar and Brian have continued to work together, with Brian serving as a producer, arranger and composer on many of Omar's recordings, and Omar making the occasional appearance in one of Brian's film scores. Süleyman the Magnificient (13023-2), their first recording, was followed by Fire Dance (13032-2) (1990) which was nominated for a Grammy. They subsequently recorded Mystical Garden (13092-2), Crescent Moon (13176-2) and Whirling (13086-2) on the Celestial Harmonies label. Their last recording together was Beyond The Sky (13047-2) (1993).